Important, possibly life-altering, reading for every living, breathing human being." --"Boston Globe"
In "Cooked," Michael Pollan explores the previously uncharted territory of his own kitchen. Here, he discovers the enduring power of the four classical elements fire, water, air, and earth to transform the stuff of nature into delicious things to eat and drink. Apprenticing himself to a succession of culinary masters, Pollan learns how to grill with fire, cook with liquid, bake bread, and ferment everything from cheese to beer. Each section of "Cooked "tracks Pollan's effort to master a single classic recipe using one of the four elements. A North Carolina barbecue pit master tutors him in the primal magic of fire; a Chez Panisse trained cook schools him in the art of braising; a celebrated baker teaches him how air transforms grain and water into a fragrant loaf of bread; and finally, several mad-genius fermentos (a tribe that includes brewers, cheese makers, and all kinds of picklers) reveal how fungi and bacteria can perform the most amazing alchemies of all. The reader learns alongside Pollan, but the lessons move beyond the practical to become an investigation of how cooking involves us in a web of social and ecological relationships. Cooking, above all, connects us. The effects of not cooking are similarly far reaching. Relying upon corporations to process our food means we consume large quantities of fat, sugar, and salt; disrupt an essential link to the natural world; and weaken our relationships with family and friends. In fact, "Cooked" argues, taking back control of cooking may be the single most important step anyone can take to help make the American food system healthier and more sustainable. Reclaiming cooking as an act of enjoyment and self-reliance, learning to perform the magic of these everyday transformations, opens the door to a more nourishing life. 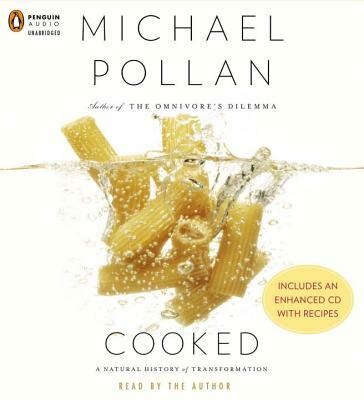 MICHAEL POLLAN is the author of six previous books, including "Food Rules, In Defense of Food, The Omnivore s Dilemma," and "The Botany of Desire," all "New York Times" bestsellers. A longtime contributor to "The New York Times," he is also the Knight Professor of Journalism at Berkeley. In 2010, "Time "magazine named him one of the one hundred most influential people in the world.